Installation view, Joseph Jagos & Chris Puidokas, Placement and Arrangement of What I Have, (2013)at School Nite (Wish Meme), all photos by Hannah Palmer Egan. 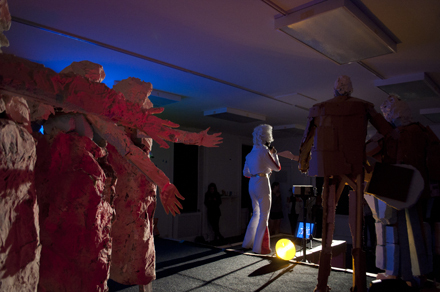 On Saturday May 4, curatorial duo Ambre Kelly and Andrew Gori, otherwise known as “The They Company,” presented School Nite, a lively evening of art and performance. The night doubled as an opening reception for Wish Meme, a new show featuring over 60 artists and curators, timed to coincide with Frieze art week. 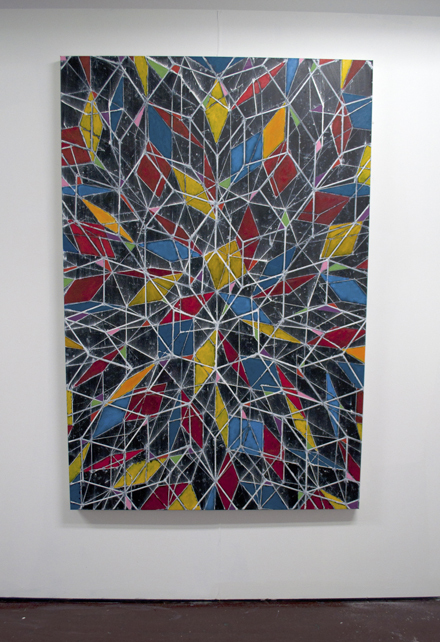 The show builds on the curators’ success with Spring Break, one of the many alternative art fairs recently cropping up alongside the Armory show. 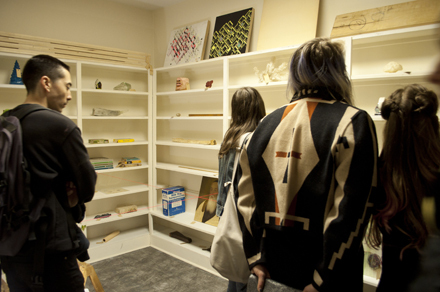 Below: two of the three closet installations in the exhibition. Stephen Zerbe, Dream TV (2013). 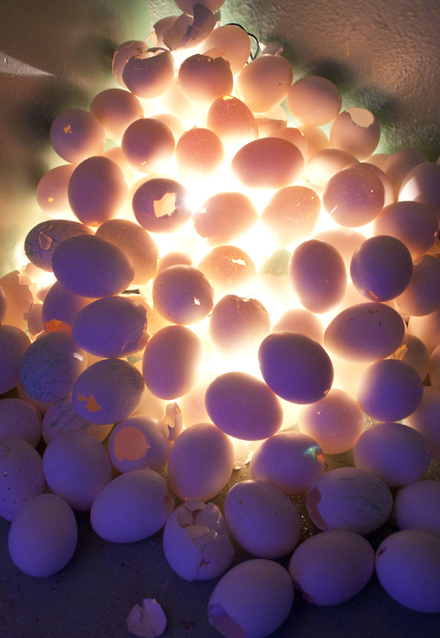 Melissa Godoy Nieto, Templo, (permanent installation, 2013). Wish Meme will re-open Wednesday, May 8 through Sunday May 12 in three stories of hallways, classrooms and closets in Nolita’s Old School on Mott. The show is a collaborative study on dreaming—the American Dream, more specifically—seen through a lens of the commodification, commercialization, and cultural sterilization, but also the reigning creativity of America’s aspirations and fantasies as individuals and as a people. Hopeless it is not; ironic, sometimes; nostalgic? It has its moments. For sale? Most of it, yes. Upon arrival, visitors enter through Anita Glesta’s Watershed, (2013), a swirling pool of Koi projected on the walls of a small room, transforming it into a fishbowl and a meditation on the water beneath New York City and the engineering conquest that keeps it at bay. On Saturday, Watershed was accompanied by a metalliferous soundtrack, courtesy of Kris Perry’s Machines, who played in the courtyard just beyond the wall. The Machines are a collection of percussive sculptures Perry assembles from obsolete equipment, industrial waste and other metal salvage and surplus, which he and his “band” work into a frenzy of rhythm and harmony. Back inside, first-floor highlights included Celia Rowlson-Hall and Hannah Fidell’s performance and video installation, #famousontheinternet (2013), and Sarah Bereza’s finely-wrought Burning Tire paintings, shown with Blaze of Thunder (2013), an interactive video piece by Fall on Your Sword, which invited the viewer to step up and push a button. Doing so provoked gruesome on-screen car crashes, to the crowd’s delight—because everyone loves a good train wreck. 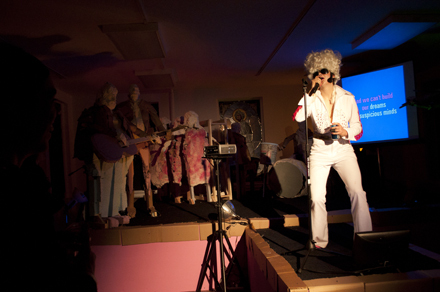 Meanwhile down the hall, Cate Giordano, as Dolly Presley (backed by papier-mâché band) (2013) crooned Dixie classics in a character-driven performance paying fab homage to (and poking fun at) faded icons of a more innocent era in American pop culture. Cate Giordano as Dolly Presley (2013). 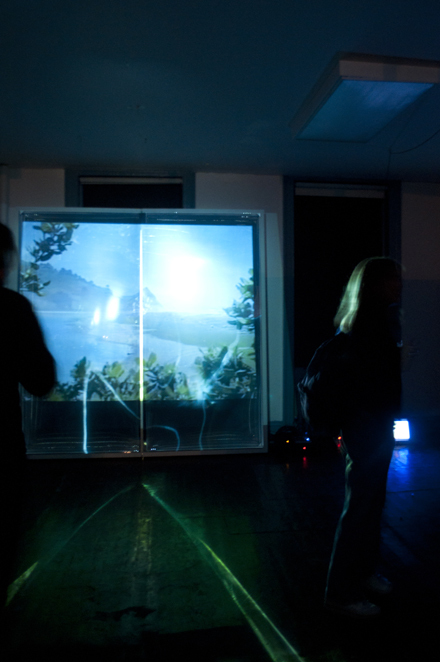 On the second floor, a video installation by Joe Jagos and Chris Puidokas stood out. 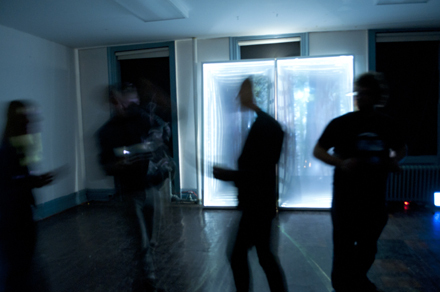 The artists placed an eerie, forested film in a darkened room and connected it to a microphone. The film faded almost to black when all was quiet, but when the mike picked up noise—people talking (into the receiver or otherwise), or jumping or banging on the walls—the film glowed brighter. Another iteration of interactive video in a single show. Joe Jagos & Chris Puidokas, Placement and Arrangement of What I Have (2013). The third floor offered the strongest drawings and paintings: curator Adam Mignanelli’s gallery included highly detailed, textured acrylic paintings by Samuel T. Adams and geometric oils by Devin Powers, while Magic Kingdom, a large gallery curated by Myla Dalbesio, included Weston Ulfig’s bright relief prints of guns (and a super cool Lego sculpture, 2013), Matt Jones’s Four Dimensions Existing Simultaneously, (oil on canvas, 2012), as well as Stephen Zerbe’s Dream TV (2013, pictured above), a closet-sized installation beautiful in its glowing simplicity. 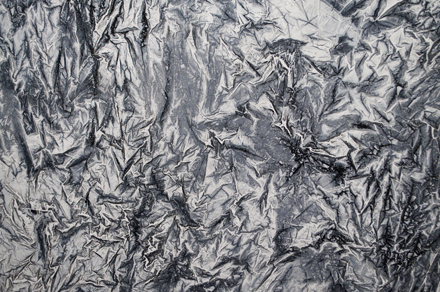 Detail: Samuel T. Adams, Terra Nova 1 (acrylic on canvas, 2013). Devin Powers, Leaf, (oil on canvas, 2012). 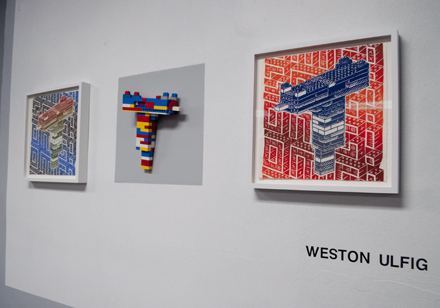 Weston Ulfig, 2 relief prints and Lego sculpture (2013). 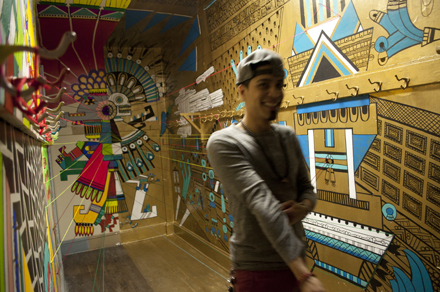 Across the hall, Joseph Burwell’s selection of geometric drawings crowned a precisely-installed vision of his “idealized studio.” The third floor offered two additional closet-installations, precisely painted by Melissa Godoy Nieto, (Templo, 2013, pictured above) and Julia Chiang, respectively. 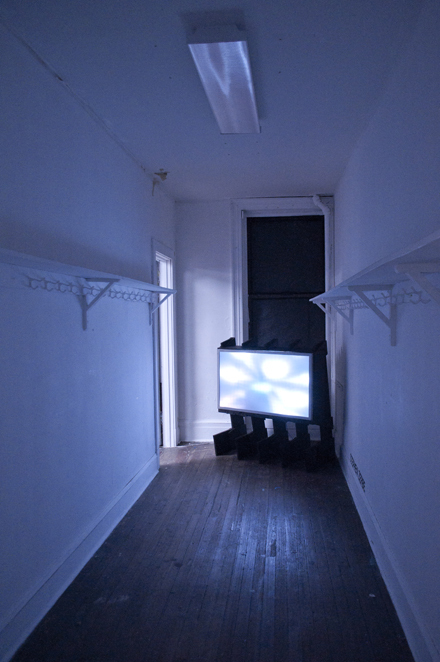 Joseph Burwell- Installation view, 2013. In Pleroma (Tide Offering) (2013), Rachel Rossin created a room-sized environment draped in light, flowing fabric and aglow in cool colors. 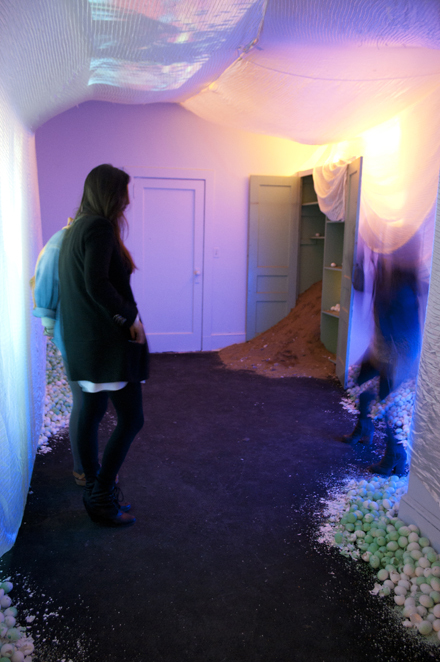 She invited the viewer to walk through 7,000 hollow eggshells, each dyed a soothing green, which felt a little like seashells left by the tide, and a closet full of sand, in case you missed her point. Rachel Rossin, Pleroma (Tide Offering), (2013). Rachel Rossin, Detail: Pleroma (Tide Offering) (2013). 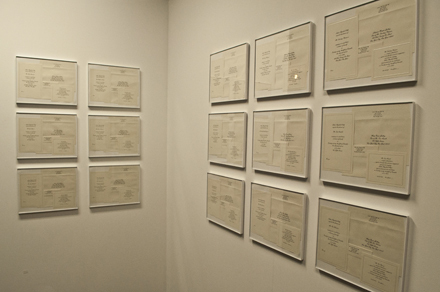 Ambre Kelly, installation view: Requests the Pleasure, (2006). Regardless of the success of those requests, Kelly and Gori, for their part, kept feet moving on Saturday, and will continue to do so through May 12, when Art Meme closes for good. 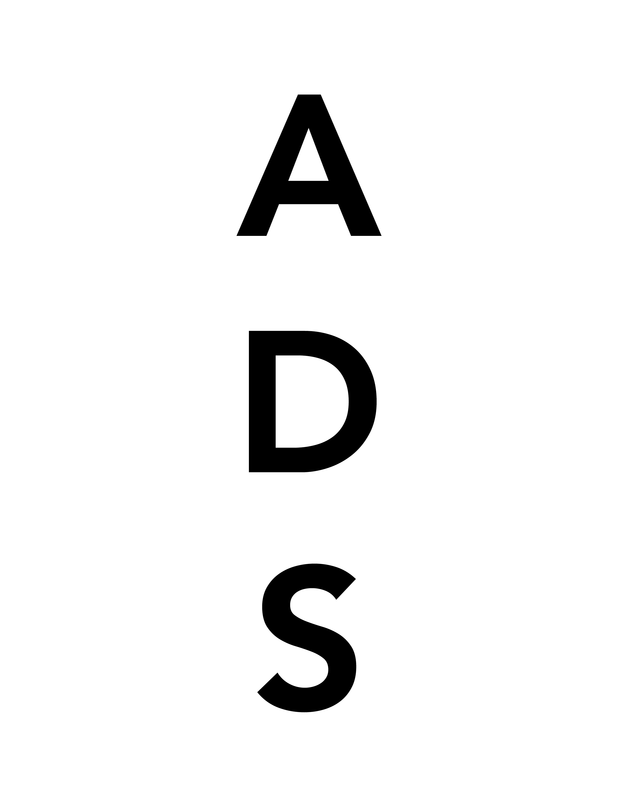 This entry was posted on Tuesday, May 7th, 2013 at 5:57 pm	and is filed under Art News. You can follow any responses to this entry through the RSS 2.0 feed. You can leave a response, or trackback from your own site.